Super-massive black holes are thought to lie at the centre of galaxies throughout time, sucking up the gas and stars from their whirling hosts. This process of a super-massive black hole eating away at the core of galaxy can produce copious amounts of energy when at it’s most ravenous. Much of this energy is emitted as light, such that super-massive black holes in galactic centres drown out the star-light from their host galaxies when at their most active. These powerfully emitting super-massive black holes are termed Active Galactic Nuclei (or AGN), with the brightest of all classed as Quasars. Given our Universe is dynamic and steadily evolving with galaxies moving around, and towards, each other under the influence of gravity, a natural question is to ask what happens when these super-massive black holes meet? Durham astronomers are involved in a number of studies looking for meetings between distant AGN or Quasars to better understand the evolution of galaxies and their super-massive black holes. Our study recently published in the Monthly Notices of the Royal Astronomical Society, has found such a meeting, with an AGN approaching close by to a distant bright Quasar. This pair, lying at almost 100 million light years from the Earth, represents one of the closest known pairings of two active super-massive black holes. The Quasar, bright enough to have been known for a few decades already, was hiding in the outskirts of it’s bright light, a fainter SMBH which has only now been discovered due to recent advances in technology and in particular the MUSE integrated field spectrograph on the VLT in Chile. Using MUSE, the study identified the counterpart AGN due to light emitted from Helium ions around it’s centre, and named it Jil, (or to translate from Klingon: neighbour). 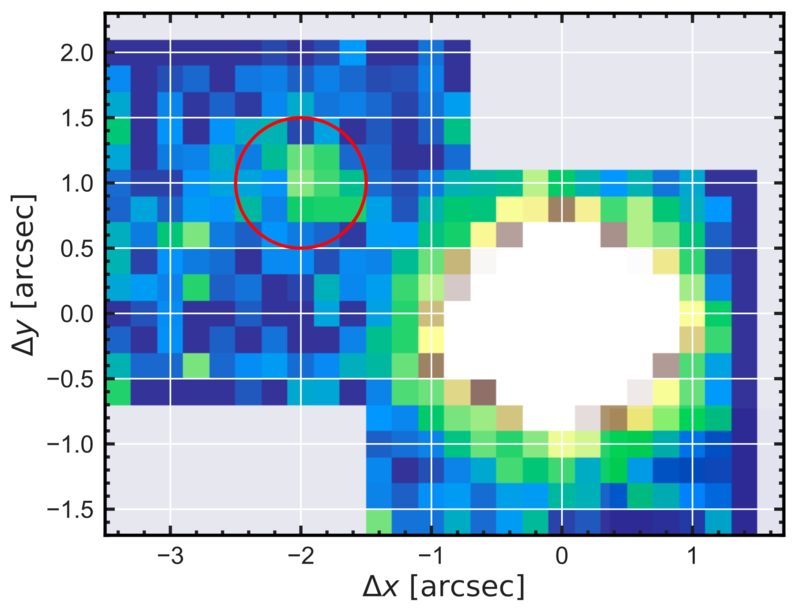 In a second paper, the team have now confirmed Jil to be a genuine source using the (in-part) Durham-developed KMOS infrared spectrograph on the VLT, identifying the presence of Oxygen ions in the AGN via their bright emission at optical wavelengths. Jil is separated from its close neighbour by 17,000 light years, which is smaller than the extent of our own galaxy, the Milky Way. Jil represents an excellent opportunity to understand what happens when active galaxies approach each other in the early Universe, and understand how super-massive black holes, and their host galaxies, coming together can contribute and potentially accelerate the growth of these massive monsters of the cosmos. This image is from KMOS and shows the Oxygen emission from Jil (circled) and the Quasar.